According to research from NeighborWorks America, 90% of consumers consider owning a home an important part of their American Dream. But the homeownership rate is falling nationally, and buying activity is simply not where it should be. 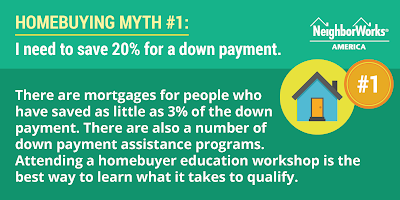 That's because three major misconceptions about what it takes to become a homeowner – down payment, credit and lender approval – are combining to hold back many qualified consumers from taking the first steps towards that dream. Mortgage rates have been consistently low for a while now, but many potential homebuyers are on the sidelines because they believe the wrong facts about homeownership and what it takes to be a homeowner. 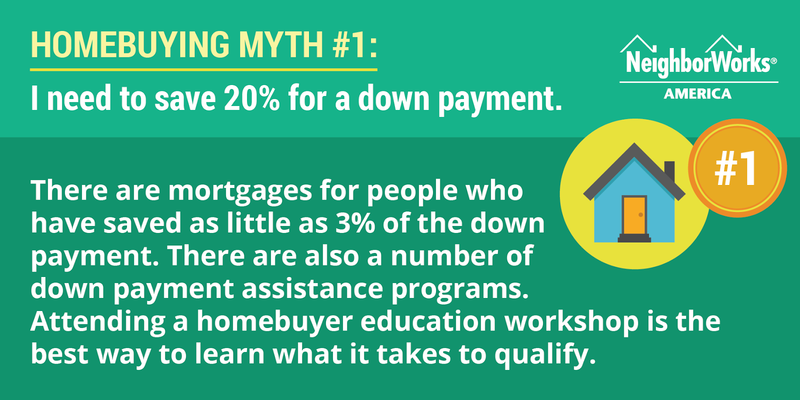 Myth #1: "I need to save 20 percent"
Reality: Many potential homebuyers believe they need a 20% down payment to qualify for a mortgage. Nothing is further from the truth. Lenders throughout our community have mortgages for people who have saved as little as three percent of the down payment. Importantly, there are special lending products in our market where a qualified buyer with only a three percent down payment may not have to pay mortgage insurance. Not everyone is eligible for these loans, but attending a homebuyer education workshop is the best way to learn what it takes to qualify. 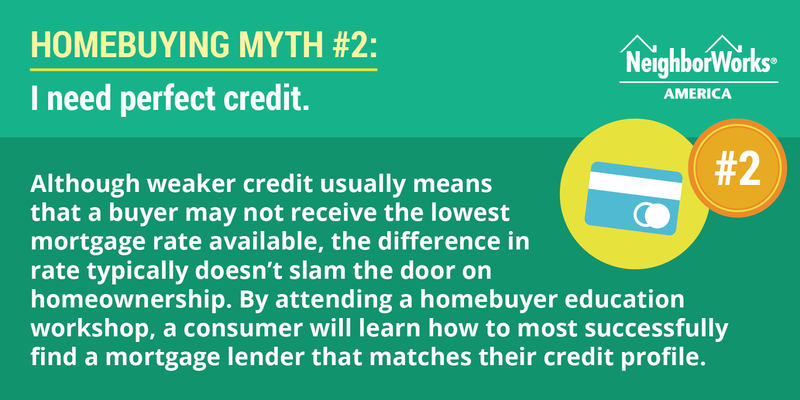 Myth #2 "I Need perfect credit"
Reality: It's not necessary to have perfect credit to qualify for a mortgage. Although weaker credit usually means that a buyer may not receive the lowest mortgage rate available, the difference in rate typically doesn't slam the door on homeownership. 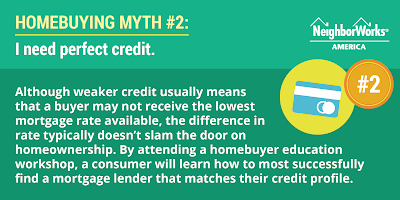 Moreover, by attending the homebuyer education workshop, a consumer will learn how to most successfully find a mortgage lender that matches their credit profile. While perfect credit isn't necessary to qualify for a mortgage loan, homebuyer education will help a homebuyer manage their credit during the process. Lenders are checking credit practically up to the time of home purchase. By not paying attention to credit during this process – for example missing a single payment for 30 days – may severely damage a credit report. Homeownership counselors at NHS of New Haven work with consumers every step of the way. 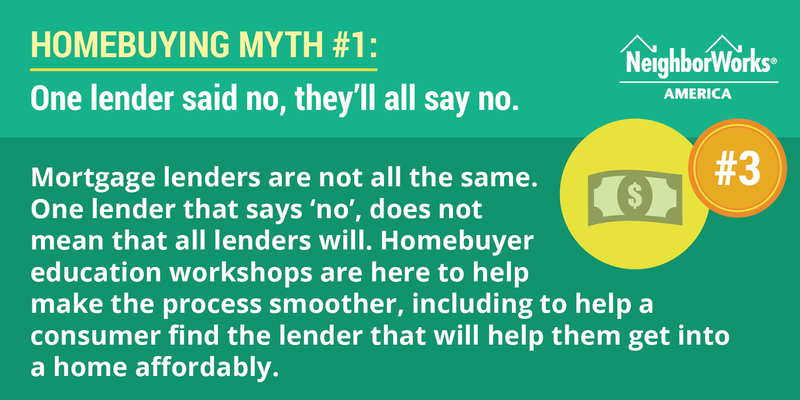 Myth #3: "One lender said no, they'll all say no"
Reality: Mortgage lenders are not all the same. 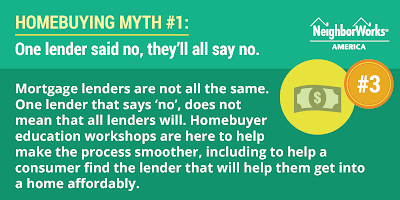 One lender that says no, does not mean that all lenders will. The NeighborWorks survey found that most Americans are confident that they could find the mortgage that is right for them, but one-out-of-five are not confident at all, and two-thirds of consumers say that the entire home buying process is complicated. NHS of New Haven homebuyer education workshop is here to help make the process smoother, including helping a consumer find the lender that will help affordably get a home today and for the long-run. 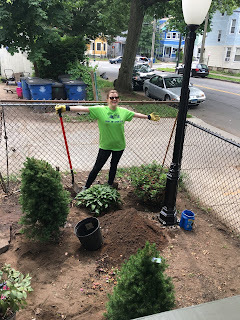 On Saturday, June 11, 2016, NHS of New Haven culminated a week-long series of events and activities with a neighborhood clean up, walking tour, and open house at 17 Bassett Street in New Haven! Saturday, June 11, 2016, was a day full of activities to culminate NeighborWorks Week® 2016! This photo was taken at our Garden Workshop at our NHS campus. 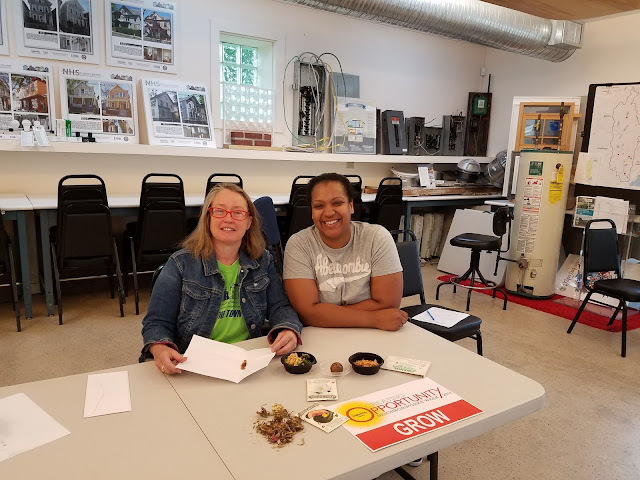 The Seed Saving and Seed Swapping workshop was free, open to the public, and taught by certified Advanced Master Gardener Rachel Ziesk; in partnership with Common Ground, RMA. Participants learned all the ins and outs of saving seeds from their favorite vegetable crops. The class covered growing, harvesting, and storing seeds, as well as ways to ensure healthy crops from saved seeds. Day 7 of our NeighborWorks Week activities -- Creating Opportunities to Learn! NHS worked with the Urban Resources Initiative on Sherman Parkway, planting trees to create an urban oasis! Our Community Building & Organizing Staff Getting Ready to Fire Up the Grill! Day 6 of our NeighborWorks Week activities (Thursday, June 9, 2016)! Creating Opportunity to Succeed with our HomeOwnership Center's Money Management Workshop! Participants of the class were surprised with a BBQ dinner prior to the workshop. The Money Management workshop covers the importance of managing money and understanding credit so that participants will be a wiser consumer and avoid financial pitfalls. Day 5 of our NeighborWorks Week activities (Wednesday, June 8, 2016)! 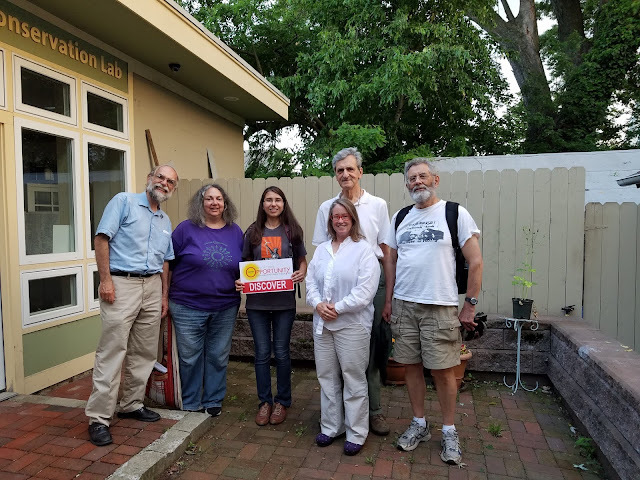 Creating Opportunity to Connect with the West River Watershed Coalition! The West River Watershed Coalition is a group of organizations and individuals working together to improve the West River. 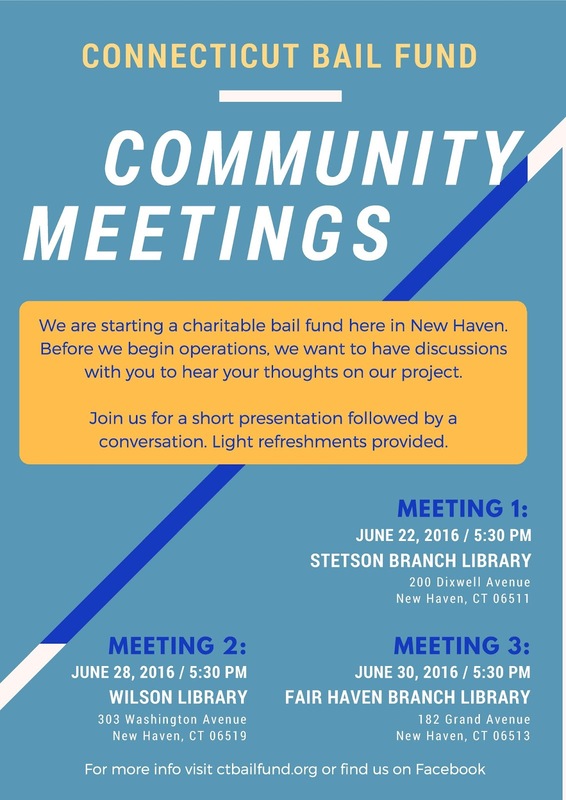 The New Haven Energy Task Force met on June 7 in our Energy Conservation Lab. The New Haven Energy Task Force meets the first Monday of every month at 5:30 pm at NHS’ Home Improvement and Energy Conservation Lab. 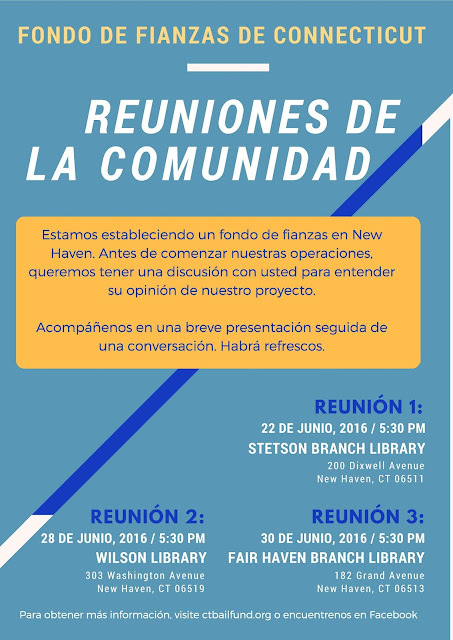 Members of the public interested in energy issues as they relate to residents and neighborhoods of the City of New Haven are welcome. For more information, please contact kfay@nhsofnewhaven.org. On June 4th & 5th, the West River Watershed Coalition (which NHS of New Haven is a part of) sponsored two incredible West River hikes. NHS staff member, Kathy Fay, managed to score this awesome shot with our NeighborWorks Week signage! We caught Tom Citarella on his way to prepare to teach our Pre-Closing Education class! This class provides an overview of the range of financial and practical topics that a homebuyer should understand before completing the homeownership process. Bike & Build is a nonprofit organization that organizes cross-country cycling trips to benefit affordable housing in the United States. In between their riding days, each group takes the time to "build" and volunteer at different organizations that promote affordable housing. On Wednesday, June 1, NHS welcomed 30 cyclists at the intersection of Sherman Parkway and West Division Street. 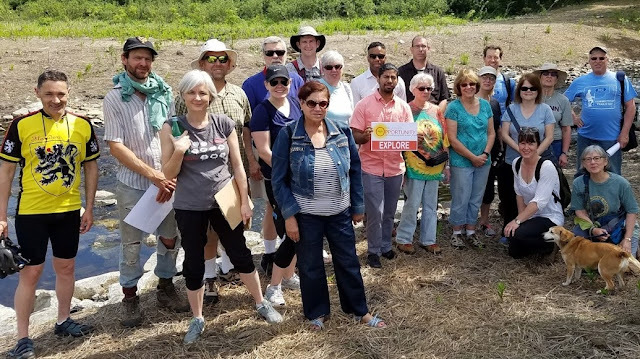 Once there, the group joined another 25 volunteers from the Hopkins School in a massive clean-up around Beaver Ponds Park. 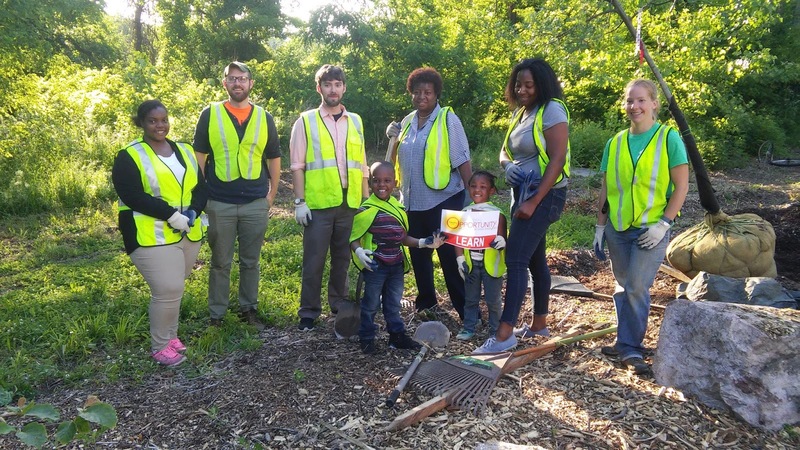 The two groups transformed the strip of land by pulling weeds, planting flowers, picking up trash, and distributing mulch around the trees. It was a beautiful transformation and we encourage everyone to drive by Sherman Parkway to see all of the work that has been done! You can find more photos of our volunteers on our facebook page.